called "aquitards"2—can inhibit upward or downward water flow from coalbeds. This inhibited flow essentially causes a water-saturated coalbed to be "confined" with respect to contained water. When water in a confined coalbed connects to the water table at an elevation above the elevation of the coal seam, the water in the coalbed may become overpres-sured with respect to the pressure exerted by a static column of water in the overlying rock (termed "hydrostatic pressure" or "hydrostatic head"). When a well is placed in a confined coal seam, the water level will rise to an elevation above the seam. Because of the discontinuous nature of coalbeds, not all groundwater flow in coal-bearing basins can be described by simple hydrogeological models. These models usually describe water as moving from higher elevation "recharge" areas into lower elevation discharge areas from which the water may flow out as streams and springs. Groundwater "recharge" is a process by which water moves downward from the surface to groundwater and can occur naturally (e.g., rainwater percolation) or through artificial (human-induced) means. In some basins where natural recharge areas are located far from downgradient portions of a coalbed or other aquifers, replenishment of these aquifers by infiltrating precipitation may not occur within human lifetimes or even thousands to millions of years when water is removed from the aquifer. In essence this "old" or "fossil" water in a coalbed aquifer can be considered a "nonrenewable" resource once removed from the coalbed. The "age" of the water, or its residence time in the coalbed, thus also indicates the degree to which the CBM water is connected to surface water and shallow groundwater. "Old" water would suggest slow or inhibited connections to surface water or shallow groundwater that otherwise might serve as a source of "new" water to a coalbed. Determining the connections between coalbeds and surrounding aquifers (hydraulic connections) and the renewability of the water resource in the coalbed is important to understanding the consequences of water removal from the coalbed during CBM production (described in detail later in the chapter). The age of the water in coalbeds from which CBM is being extracted thus can become an important factor in determining how produced water is managed. The next section outlines the development of methane and associated water in coalbeds. Subsequently, geological and hydrogeological characteristics of each basin are briefly described because of the role they play in determining both the volume and quality of water produced during CBM extraction. 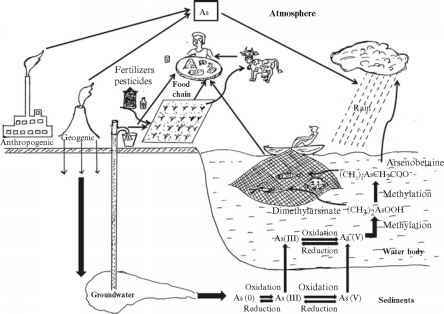 2An "aquitard" is a confining bed or geologic material that retards but does not prevent the flow of water to or from an adjacent aquifer, does not easily yield water to wells or springs, and may serve as a storage unit for groundwater. An "aquiclude" is a body of relatively impermeable geologic material that can absorb water slowly but does not transmit it rapidly enough to supply a well or spring (Bates and Jackson, 1987). Methane associated with buried coalbeds is originally formed from one of two processes: thermogenesis or microbial methanogenesis. Thermogenesis involves the degradation of organic matter by temperatures usually greater than 120° C (248° F) associated with pressure from burial at depths greater than about 1,000 feet. The San Juan Basin contains coals with themogenic methane. Microbial methanogenesis is the decay of organic matter through microbial activity at relatively shallower depths and lower temperatures than those related to thermogenesis; the Powder River Basin coals contain methane generated in this way. In addition to genesis of methane during compaction and heating of organic material, coals develop systematic fractures or "cleats," roughly analogous to cleavage planes in minerals (Riese et al., 2005). The presence of water in the coalbeds keeps the methane adsorbed on the surfaces of the coal and within the cleats and adsorbed to walls in the micropore structure of the coal matrix (see Figure 1.1). Water in the coalbeds may derive from (1) original water ("connate" water) associated with freshwater or marine settings in which the organic material was originally deposited, and/or (2) water (e.g., rainfall) that later percolated from the surface through to the coals as they were progressively buried. To extract methane adsorbed to the coal, water must be pumped out of coal seams to lower the water pressure (head) and allow the methane to desorb, coalesce, and bubble into the pumped water, analogous to the formation of bubbles of carbon dioxide in a bottle of carbonated beverage when the cap is removed (see Figure 1.1). The amount of water that must be removed from the coalbeds in order to release methane depends on the original water pressure in the coal, the physical capacity of the coal to hold and release water, and the extent to which coals may be hydraulically connected to adjacent geological formations. Water production records show that the volume of water pumped from individual CBM wells generally decreases exponentially with time, with a corresponding increase in the rate of methane production (see Figure 2.3). In many cases, water pumping may discontinue within 10 to 20 years of initial pumping, while methane production may continue. In contrast to conventional oil and gas fields where produced water is sometimes rein-jected into the producing formation to enhance oil and gas recovery, CBM produced water is not returned to the coal seams from which it was extracted because doing so would hinder additional methane recovery. Thus, other options are considered with respect to storage, disposal, or use of the CBM produced water. FIGURE 2.3 Schematic production curves for typical CBM wells show that operator-controlled water production rates decrease exponentially over time while methane production increases before moving into a stage of decline. Water production is a function of initial, operator-controlled pumping rates that aim to reduce pressure and stimulate flow of water and gas to the well. Once gas flow has been achieved, over time, the operator will gradually reduce the water production rate until the gas production rate is maximized. SOURCE: Nuccio (2000). pumped water enters wells during production depends on the natural hydraulic properties and water-filled porosity of the coal seam containing the methane and the operator-controlled water-pumping rate. Shallow, weakly-consolidated coalbeds may have extensive internal fractures and interconnection of fractures that produce a porous and permeable formation capable of releasing large amounts of water during methane production (e.g., the Powder River Basin). In other areas where the methane-bearing coalbeds lie at much greater depths, the amount of water that must be pumped from the coal and the rate at which that water can be pumped to facilitate the release of methane are often limited by the effective water-filled porosity and permeability of the coal (e.g., the San Juan Basin). The limited interconnectivity between fractures and cleats in these deeper coals often requires use of hydraulic fracturing to stimulate release of the methane (Box 2.1; see also Chapter 5). CBM production and associated produced water volumes are also a function of economic conditions. Generally, if the price of natural gas goes below a certain price point, the CBM operator will begin to "shut in" (cease to produce from) wells, which will reduce the quantity of produced water generated by the industry. When natural gas prices are above a certain level, CBM operators will generally increase production to generate more income and profit. The total volume of CBM produced water generated by a CBM operator will thus vary as a result. Other factors such as contract deliverables, reservoir management requirements, and reservoir energy may also affect the decision to shut in a well or keep it in production. Hydraulic fracturing is a technique used in many oil and gas production settings to help release oil or gas from the geological formation and allow the hydrocarbon to flow more freely and consistently to the well bore. The technique injects fluids and sand under pressure into the formation of interest to open and stimulate the growth of new fractures, thereby increasing the number of pathways through which oil or gas can reach the well. Among the CBM basins examined in this study, hydraulic fracturing is used to enhance the flow of methane gas in the San Juan, Raton, Piceance, and Uinta basins. Hydraulic fracturing is used very infreque ntly in CBM operations of the Powder River Basin due to the high natural permeability of the shallow, methane-bearing coal seams. The standard industry practice for oil and gas operators to fracture a formation hydraulically is to fill the space between the outside of the steel casing of the well pipe and drill hole with cement along some or all of the well bore to the top of the target rock unit from which oil or gas (including methane from coalbeds) is going to be recovered. Holes or perforations are then blasted through the well casing opposite the target rock formation (for CBM production, the target is the coal seam). Fracturing fluids, if used, are pumped under high pressure through these holes into the target formation and are then pumped, together with the oil and gas and/or any produced water, back to the surface for recovery and disposal. 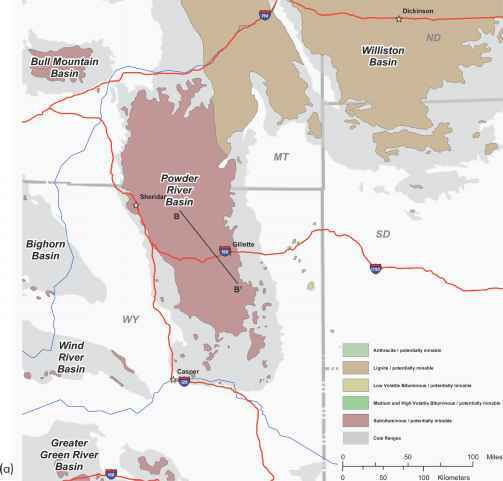 In the Montana portion of the Powder River Basin, water, rather than other fluids, may be injected into CBM wells by some operators to improve conductivity around the well bore. The well casing and encasing concrete in a CBM well are designed to maximize recovery of all types of fluids from the target formation and to minimize loss of fluid, whether hydraulic fracture fluid, oil, gas, or water, to other geological formations along any part of the well bore. 3TDS (total dissolved solids) is an expression for the combined concentration of all inorganic and organic substances contained in a liquid which are present in a molecular, ionized or micro-granular suspended form, and which will pass through a sieve opening of 2 micrometers (Water Systems Council, 2007). cal Foundations" later in this chapter provides the background for the use of these terms throughout the report. geological cross section through the basin depicts a major coal-bearing and CBM-producing rock unit, the Fort Union Formation, and the overlying Wasatch Formation. Although oil and gas production began in the Powder River Basin in the 1920s, the first CBM well was not drilled there until the late 1980s (in the Wyoming portion of the basin). By the end of 2008, approximately 18,000 CBM wells were extracting methane from the Tongue River and Lebo Shale members of the Fort Union Formation, mostly at shallow depths ranging from approximately 450 to 4,500 feet (USGS, 2005). Wells shallower than 450 feet have produced methane from coalbeds in some localized areas. The Wyodak coal zone, including the Lower and Upper Wyodak and Wyodak Rider zones, contains the Canyon, Anderson, Smith, and Big George coals, which are CBM production targets. Vertical and lateral correlations in the Fort Union Formation show successive splitting of thick coal beds resulting in overlapping coal zones (Flores et al., 2010). This effect has played a role in the use of slightly different nomenclature to identify coal horizons in the basin. For example, the Anderson coal is sometimes referred to as the Wyodak coal; in the northwestern part of the basin and in Montana, the Anderson and Canyon coals are interleaved with the Dietz coal (sometimes referred to as the "Anderson-Dietz coal"). The Smith and Big George coals are not easily differentiated in every part of the basin and are sometimes referred to as the Smith/Big George coal, or as in the case of this cross section, only as the Smith coal. Elsewhere in the basin, the Big George coal occurs in the same part of the Wyodak Rider zone and is identified as such (Copeland and Ewald, 2008). 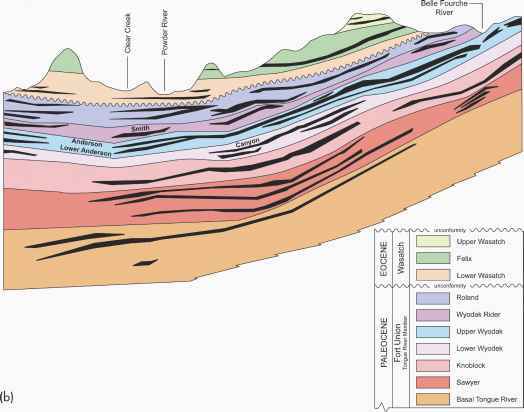 The Lebo Shale Member is not depicted on this cross section but lies below the Tongue River Member. SOURCES: (a) ALL Consulting (2003); (b) Adapted from Copeland and Ewald (2008).